How to draw a Manga character, Akane Tendo from Ranma 1/2. Akane Tendo (天道 あかね ) is the female protagonist of the series and Soun’s youngest daughter at age 16. She is a very insecure, awkward and sensitive girl with a hot temper and a big heart. Akane is the shortest of the main characters. 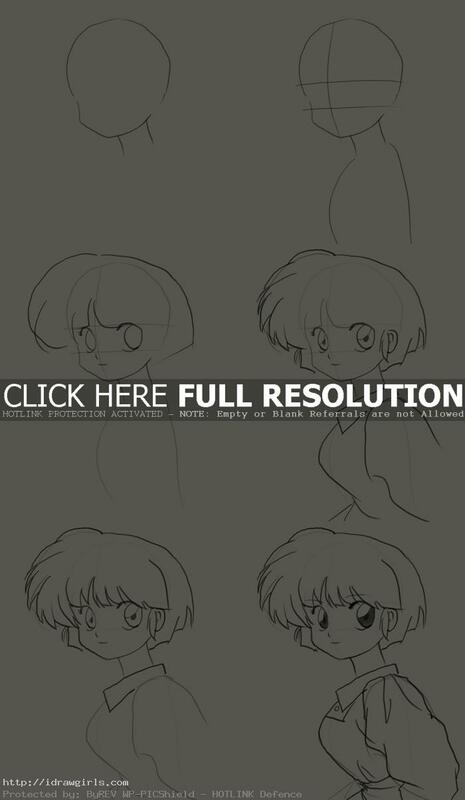 In this tutorial you will learn to draw a Akane Tendo from Ranma 1/2. I will show you step by step drawing her face and partial body. Ranma 1/2 is one of my childhood’s favorite Manga series. I am drawing her as close to the original art work as a tribute to the series. Hope you like it, but moreover I hope you will learn drawing from the tutorial. Again I usually start my rough sketch with simple geometry shapes to construct the basic Manga head and body. By following this process, you will find drawing is lot easier. It is very important to get the shape, proportion and placement right in the beginning. If you understand its basic foundation, it will be easier to draw anything. She has short black hair (blue highlighted in the anime) and brown eyes. At the beginning of the series she had long hair, but after it was cut off during a fight between Ryoga Hibiki and Ranma, she kept it short for the rest of the series. She usually wears the girls’ uniform for Furinkan High School, but has a wide variety of outfits. For training or anticipated combat, Akane wears a light yellow gi. Below are step by step how to draw Akane Tendo. Step one, I drew a circular shape for her face and head. Step two, I drew first horizontal line (on top) intersect with a vertical line in the middle of the face. The lower horizontal line equals to the height of her eyes. Step three, I drew both her eyes in. The distance between both eyes equal one eye. Imagine an invisible eye right in the middle while you draw. I also drew nose, mouth, and rough sketch the shape for her hair. Step four, I added minor detail to her eyes, face and hair. Step five, I sketch her uniform roughly. Step six, I refined and finished the rest of the drawing. Done!